Following the purchase of a steer during the Cowley County Fair 4-H/FFA Market Livestock Auction held at the Winfield Fair Grounds on Aug. 1, Cowley College donated a total of 658 pounds of meat to Manna Ministries in Arkansas City and the Winfield Community Food Pantry on Monday. “As fellow community members there are very few opportunities which bring more joy than providing food for our community when they are at points of need,” Cowley College president Dr. Dennis Rittle said. 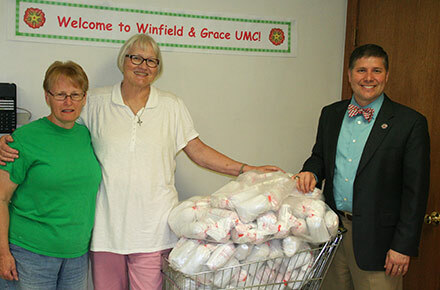 Representatives from the college met with Winfield Community Food Pantry volunteers Gayle Walker and Kim Pringle at the Grace United Church in Winfield. “The kids that raise the steer benefit from the College’s purchase and now the community will benefit from the College’s generosity as well,” Walker said. Phil Jarvis, Director of the Winfield Community Food Pantry, said there is a definite need for the beef. The Pantry is housed in the basement of Grace United Church and pays no rent or utilities. The Pantry, which is located at 320 College Street, is staffed entirely by volunteers.